1. I bought your insightful book Charting Change – How can I get the supplementary materials (26 of 50 Change Planning Toolkit™ tools) that go with the book? Charting Change book buyers can contact me using my contact form here and get me their proof of purchase. Then I will send out the Change Planning Toolkit™ Basic License to them as an 11″x17″ scalable pdf download. Book buyers can upgrade from the Basic License to the Bronze License or get their organization on the path to success with a site license at any time. 2. Who is the Change Planning Toolkit™ designed for? The Change Planning Toolkit™ was designed for change leaders, project managers, and program managers to make it easier to successfully plan and execute projects, programs, change initiatives, business transformations, and digital transformations. 3. I’ve heard amazing things about the Change Planning Canvas™ – How can I get a copy of it? Is there a poster size? Buy a copy of my latest book Charting Change, contact me with proof of purchase and I’ll send out the 11″x17″ of the Change Planning Canvas™ along with 25 other great tools! Or, purchase a basic individual educational license and you’ll get instant access to these same 26 of 50+ tools along with a digital copy of the book (hardcover option in certain geographies). Or, purchase a bronze individual educational license for the Change Planning Toolkit™ and you’ll get all 50+ tools, including the Change Planning Canvas™ in a scalable 11″x17″ pdf PLUS a Quickstart Guide PLUS a digital copy of the book (hardcover option in certain geographies) PLUS several discounts. 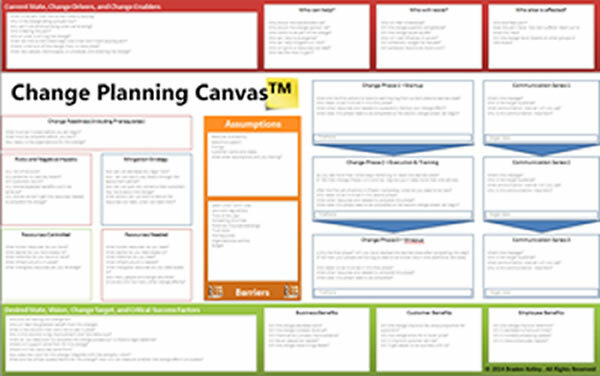 There is a 35″x56″ poster size version of the Change Planning Canvas™ available for commercial site licensees. Consulting and training companies looking to grow their business, or organizations looking to increase their organizational agility and beat the 70% change failure rate should contact me about site licenses starting at $2/yr per employee. 4. 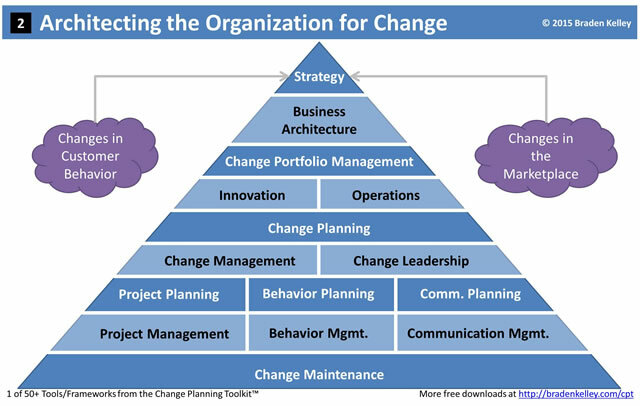 What exactly is the Change Planning Toolkit™? The Change Planning Toolkit is collection of 50+ tools to make change planning more visual, collaborative, and fun! It is designed to be used by PMP’s in project management as well, and dovetails nicely with the ACMP Change Standard for change management professionals. In fact you can get a nice ACMP Standard Visualization in the ten free downloads. 5. What do people get when they purchase the Change Planning Toolkit™ Bronze License? 6. What differentiates the Change Planning Toolkit™ from the competition? First of all, I created the Change Planning Toolkit™ because so much of what project managers and change practitioners need to be successful didn’t exist! So, it has been designed to play well with the Project Management Body of Knowledge (PMBOK) from the Project Management Institute (PMI), the Change Standard from the Association of Change Management Professionals (ACMP), and ADKAR from ProSci. But, the Change Planning Toolkit™ delivers value for project managers and change practitioners that those can’t. In fact, I created a Visual Project Charter™ and a visualization of the ACMP Change Standard as free downloads to help ACMP and PMP practitioners be more successful within their existing frameworks. So, no matter what project management or change management methodology you like to use, the Change Planning Toolkit™ will feel familiar, and will increase your ability to achieve success with the kinds of projects and change initiatives you’re already running! 7. What’s your view on change management versus project management? Most people talk about change management as if it is a subset of project management, but that’s so not true! People need to change this thinking because it’s a big reason why so many projects fail. Look for more AMA (Ask Me Anything) sessions on the Change Planning Toolkit™ and The Experiment Canvas™ in future weeks! FYI – On Twitter I am @innovate if you aren’t already following me.